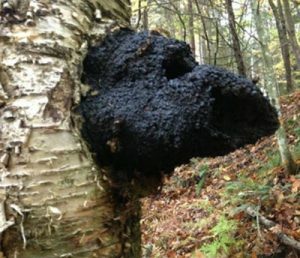 The chaga mushroom (Inonotus obliquus) is a parasitic fungus chiefly found in birch trees. The fungus forms an irregularly shaped sclerotium on the infested tree. A sclerotium is a compact mass of hardened fungal mycelium that contains food reserves for the fungus. The sclerotium of the chaga mushroom is rich in melanin and therefore mostly black. The chaga sclerotium is used as a food supplement and also included in some folk remedies. The sclerotium is removed from the tree and grounded into a fine powder, which is used to brew a beverage. If you plan on buying chaga extract, make sure to check what you’re actually paying for. A lot of products in the trade marketed as chaga extract only contains a diminutive amount of ground fungus. For some products, the number is less than 5%. The rest of the product is typically a cheap filler, such as polysaccharide extract. The typical habitat for the chaga mushroom is birch forests in the Northern Hemisphere. This is a circumboreal species. It is most commonly seen growing on Birch trees (members of the genus Betula), but can also be found on trees such as Beech (genus Fagus), Oak (genus Quercus), Alder (genus Alnus), and Poplar (genus Populus). When the fungus attacks a non-birch tree, the result is often buried stem cancer with no visible sclerotium development. Since the chaga sclerotium is so desired in the health food and dietary supplement industries, attempts have been made to cultivate it, but so far, the results have not been very promising. It is possible to get the fungus to grow on simulated mediums, such as potato dextrose agar, but the resulting sclerotia exhibit a reduced and markedly different levels of metabolites compared to wild birch-growing sclerotia. In one attempt, sclerotia grown in this artificial fashion exhibited a markedly a reduced number of phytosterols. Chaga spores (basidiospores) enter the birch tree through a wound. Poorly healed branch stubs are especially volnurable. One or more sclerotia are formed. An otherwise healthy tree can live with chaga for a very long time, and there are known cases of trees that have been infected – without dying – for over 75 years. The fungus will not enter its sexual stage until the tree, or a sufficient portion of it, has died. During the sexual stage, the fungus will produce fertile fruiting bodies underneath the bark. Initially these fruiting bodies are white, but they eventually turn brown. Usually, this goes on undetected since it is hidden by the bark. The fruiting bodies produce basidiospores, which spread to other trees and infect them if they find a wound.